A banana was hurled straight at Anzhi Makhachkala defender Chris Samba at the end of their 1-0 loss at Lokomotiv Moscow on Sunday. Samba was playing only his third match in the Russian Premiership, having signed from Blackburn Rovers for an undisclosed fee in February. 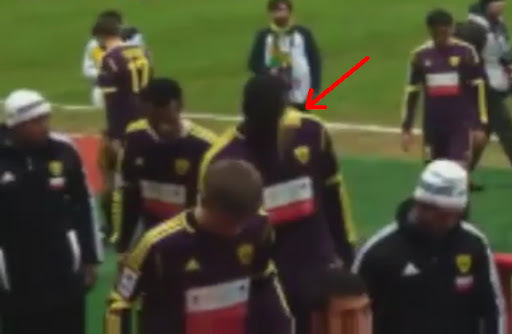 And Anzhi have called on Lokomotiv to identify the person who threw banana at the Congo international. "A banana came down at Samba from the VIP section, as the teams were leaving the field. Who threw it is unknown," read a statement on Anji's official website. "Samba picked up the banana and threw it back. In our opinion this was the best and most appropriate response to those responsible." Samba, who, when hit by the banana, picked it up and threw it back into the crowd, has expressed his regret that the incident took place in front of children but declined to discuss the matter as a racial issue. He told reporters after the game: "I'm very upset that such misconduct took place in view of children who were sitting on those very stands. It can serve as a bad example for them. "I try not to think about racism. I just want to believe that such problems do not exist on a global basis. Maybe I am mistaken but I do want to believe in it. "As a rule any scandal of this kind is a result of a misconduct committed by one silly person. I don't want to react to this." This is the third time in the past year that an Anzhi player has been on the receiving end of such an episode. Brazilian legend Roberto Carlos was the victim of banana attacks at stadiums in St Petersburg and Samara last year.